In the early days, most guitar pedals were used with batteries, and we simply set up our chain of two or three pedals on the floor. It took all of 30 seconds, and we were up and running. But as guitarists started assembling larger chains, pedalboards (to keep the pedals in one place, with all patch cables connected) became the norm. And at that point, getting a power supply for the pedals also starts to become a good idea. But what to do, and what to get? 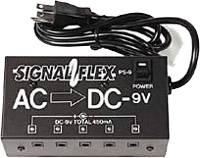 This is the simplest form of power source for several guitar pedals. A wall wart (AC->DC adapter, to be precise) feeds all the pedals through a splitter cable, known as a ”daisy chain”. The chain looks like it is wired in series, but that’s only an optical illusion – each plug is actually wired in parallel inside (+ to +, – to – throughout). Typical units: Boss PSA, Truetone 1spot, Godlyke Power-All. Pros: Simple and cheap. The only limit is the adapter’s capacity – you can use all of it to a single pedal, if need be. 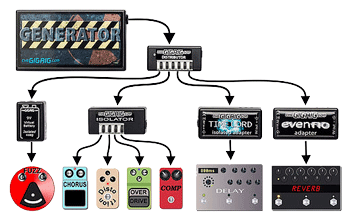 Cons: All pedals have to be 9vDC (or whatever voltage the wall wart puts out), with similar current draws. This setup can get noisy fast, if you add a higher draw pedal (such as a digital delay) to the chain. Positive ground (germanium fuzz face/octavia etc) pedals can not be powered alongside regular negative ground ones. With this type of unit, all the outputs are wired in parallel, just like the wall wart/daisy chain type setup above. These aren’t very common these days, but they do exist. The upside is that like the daisy chain setup, you can use the total capacity of the power source from a single output, if you want. The downsides are also the same, plus the fact that if the power supply has an internal mains transformer (rather than a separate wall wart to power it), you can get hum from the power supply sitting too close to certain pedals. And since these (cheaper) power supplies usually have cheaper type transformers, the noise factor is quite large. Most units of this type have individual voltage regulators for each output. I’ve heard that setup called ”single-ended isolation”, which partly describes what’s going on. The V+ outputs are isolated from each other (through the regulators), while the negative/ground is tied together throughout. However, to me, the term ”single-ended isolation” sounds a little too close to ”isolation” (which we well go into later). So in order to not cause any confusion, this will be the only time you see me use that term. Typical units: MXR DC Brick, Joyo JP-02, Caline CP-5 etc. Pros: Neater pedalboard wiring, since each pedal has its own cable from the brick. If the unit has individual voltage regulators, that might help with some noise that were caused by pedals drawing vastly different amounts of power. Cons: No real isolation, which means the pedals can still interact with each other. Positive ground (germanium fuzz face/octavia etc) pedals can still not be powered alongside regular negative ground ones. Since each output has a limit, you need to make sure each pedals’ current draw is within those limits. This type of unit will provide a number of completely isolated power sources, either for each of the outputs, or in sections. This lets all the pedals think they are the only one being powered, eliminating any possible interaction between them. You can still daisy chain (using a ”splitter cable”) more than one pedal from a single output, if you like. On one of my pedalboards, I run a few three-way splitters to power the overdrive pedals from a single output, as well as a few other (relatively low and similar current draw) pedals from another. That allows me to reserve isolated outputs for pedals – in my case, two digital delays – that would otherwise cause an imbalance, due to higher current draw. 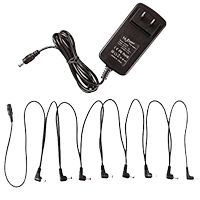 This type of supply will almost always have an onboard mains transformer – as mentioned before, only very few (such as the MXR Iso-Brick and Strymons) are properly isolated while also being powered from an external AC->DC adapter. I suspect that list will grow over time, though, since having the mains power off the pedalboard has its benefits. With the mains transformer located on or under a tightly spaced pedalboard, the type of transformer used becomes important. A toroidal transformer will emit a much smaller electro-magnetic field, compared to a more common/cheaper R- or U-core unit, which really helps keep noise down. Even so, it is a good idea to try to locate the power supply as far as possible from the start of the signal chain. That means somewhere towards the top left (when seen from above) corner. Typical units: Cioks DC8, DC10, Link series, Voodoo Lab, Decibel 11, Yankee, Truetone 1spot Pro CS7/CS12, MXR Iso-Brick. Pros: No interaction between pedals that are given isolated outputs. This means that even positive ground (germanium fuzz face/octavia etc) pedals can be powered, as long as you give them an isolated output. Cons: Cost and size. Having an on-board mains transformer means you may have to take care when positioning the power supply on the board (relative to distortion or wah pedals). There are ”in between” power supplies, which has a main section with non-isolated outputs, as well as a couple of isolated ones, often with different voltages. One of the more well-known ones in this category is the T-Rex Fuel Tank Classic (9vDC section + isolated 12vDC and 12vAC outputs), and it works quite well. Still, I don’t recommend that particular unit (and its cheaper copies, marketed under the Harley Benton brand), due to its transformer emitting a rather large electro-magnetic field. So what do I get, then? Well, it depends… while I’m a staunch supporter of using a power supply with properly isolated outputs, I’m also aware that it isn’t always needed. I’m currently running a bass pedalboard with 3 pedals + a tuner from an old Cioks Baby (9vDC, 280mA single regulator type), and it works just fine. At the same time, I have seen plenty of setups where the only cure for the noise was a proper isolated power supply. And it gets more complicated – there’s no way to say that ”for 3-4 pedals, this is what you need” or ”for 8-10 pedals, this is what you need”. Each rig is different, and some pedals simply refuse to get along, while others will happily share the power. There are no 100% consistent rules about this, so you will inevitably have to experiment. I have posted a couple of other pages that expand on this subject, one with the basic ground rules of powering and another with some tips on daisy chaining. Those pages should help you make an informed decision. Note: this article, along with the other two mentioned, replaces and expands on the two older ”how to power your pedals” articles.